Controlling My Chaos: Planting Bed Tackled! We had gorgeous weather over the weekend, so Peanut Head and I tackled a planting bed we've been procrastinating doing for a couple months. He's such a sweetie. I love tulips and he always helps me plant them in the fall. Not that we do it every year, but we have done it a few times. 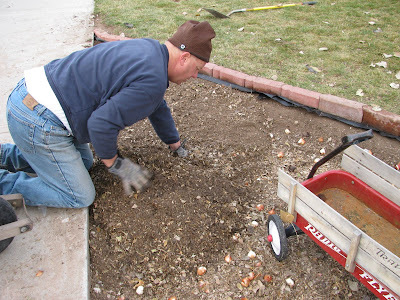 We had to get as much of the rock out of the soil as we could so the bulbs would have some room to spread out. Peanut Head is pretty handy, and he made a couple of these sieves for "cleaning dirt." I always laugh when he goes out to clean his dirt because if that isn't an oxymoron, I don't know what is. I lost count of how many buckets of rock like this we removed. But here they are now, out of our planting bed. Man, I am so tired from carrying all that rock. Oh yeah, I guess Peanut Head did that part. Isn't it looking purty now? I never thought dirt could be so pretty. Rockless dirt. That is the key. Once we got the bed ready, Peanut Head started laying down weed cloth and a brick border. I followed behind with my tulip bulbs. We took our old rusty wagon and put it right in the center of the bed. We thought it would be a cute planter platform. There are only about 200 bulbs in this bed. I don't know if it's enough. After I laid all the bulbs out, we covered them with the clean dirt. Ha ha! Clean dirt, I just can't get over that. Actually, we messied the dirt up a bit with some dead leaves. More nutrients or something like that. Peanut Head is the planter man. I'm just the muscles. The last step was to mulch in the area with bark so my bulbs will be toasty warm this winter. When spring comes it should look something like this. For more inspiring tackles, visit 5 Minutes for Mom to see what others have tackled this week. Goodness y'all did a LOT of work....that is going to be GORGEOUS!!!!! Wow can't wait to see what they will look like. What a great idea with the wagon! I laughed and laughed 'cause if I was going to talk my hubby into doing that (haha, as IF! ), I'd put in that many too. I love tulips toooo! Can't wait until spring now to see how it looks! It looks fantastic!! I can't wait to see it too!! What are you going to plant there when the tulips fade? Thank goodness for men who are handy. Great work--I know those 200 bulbs are going to give you quite a show, too! I LOVE tulips too! I can't wait to see pictures when they bloom! Keep us posted. beautiful!! you are going to have gorgeous flowers there! Won't it be fun to watch all those tulips coming in? Can't wait to see the fruit of all the labor! You are SO funny. What am I going to plant here after the tulips fade? Ha, ha! Just dead tulips girlfriend. This is my yard work for the year! I bet it will be gorgeous!!! That had to be a ton of work though! Whew! what a great tackle. This is going to look fantastic when they come up. Landscaping looks like so much work! Good job.